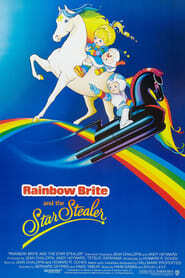 Rainbow Brite, and her magical horse Starlite, must stop an evil princess and her underlings from taking over the planet Spectra. When they meet Orin, the wise Sprite tries to make the two children get along and work together to stop the evil Princess. Orin tells them that they can only destroy her by combining their own powers against her. Getting in the way of their mission is the sinister Murky Dismal and his bumbling assistant Lurky who, as usual, are lavishing in the new gloom created by the darkening of Spectra, as well as trying to steal Rainbow’s magical color belt.